Looking for a new garlic recipe? Move on to another blog. This one is on Filipa Silva et al. as published in the Angewandte. It requires a chemical lab and not a kitchen. Biomolecule ajoune is one of the compounds that make garlic garlic. It has been demonstrated before it can be made synthetically in a lab but here is a new take. The quick summary. Step 1 alkylation of 3-bromo-1-propanol with thiourea. Step 2 hydrolysis to a thiol. Step 3 propargyl bromide alkylation of the thiol. Step 4 reaction of aryl selenocyanate with tributylphosphine libarates the selenide anion and displaces the hydroxyl group. Protecting group added. 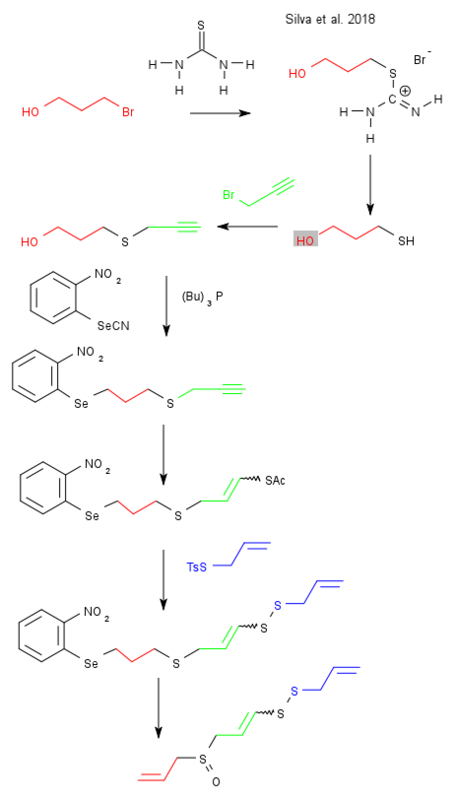 Step 5 thiol-yne reaction (none stereoselective) with thioacetic acid adds a second sulfur atom. Step 6 hydrolysis to thioenolate and tosyl displacement of allyl p-toluenethiosulfonate adds sulfur atom number three. Step 7 hydrogen peroxide oxidation (a type of selenoxide elimination) removes the protecting group. Final yield 169 grams.